Based mainly on a list published by Ukrayinska Pravda. 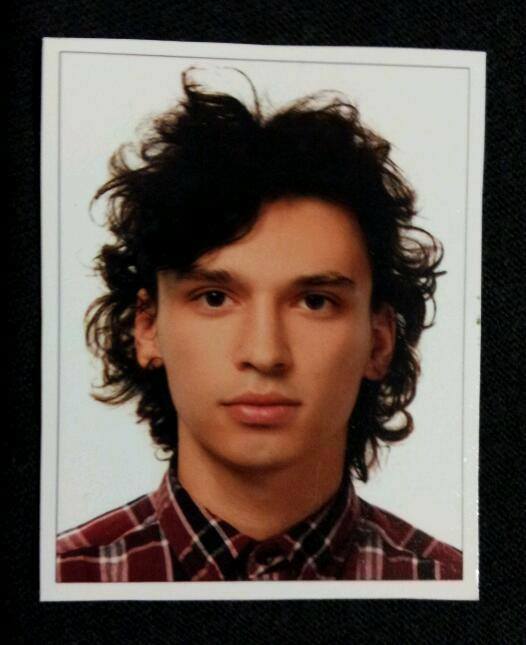 Baydovskyy Sergei, 23 years old, an employee of trunk pipelines "Druzhba". He died from a gunshot wound to the lung February 20, 2014. He lived in Lutsk, loved the city, most of all he loved his native Ukraine. One of the last quotes on his page "VKontakte" Lev Lukyanenko words: "A nation that is not ready to send the children to death, would not survive ..." He died from a gunshot wound at the Independence Square in Kiev on February 20. 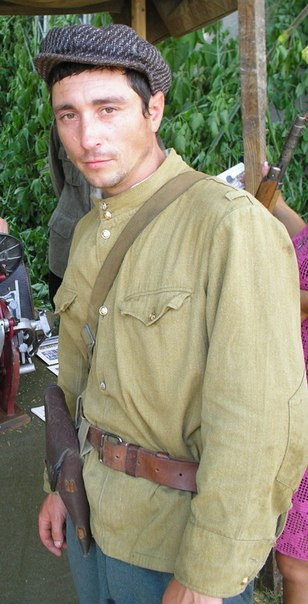 Sergey Bondarev, 32 years Kramatorska. Programmer. Died February 18 from 4-ball injuries during the first attack on the square. His wife Svetlana eight months pregnant. Vajda / Biden Bogdan, 58 years. Single. Recently, he lived with his mother in the village. Of flight Drogobytskyy area. Went on Kyiv on February 19. In the morning the next day, arrived in Kyiv, called sister "Honey, there is a real war, shoot ..." - then broke off the conversation. On the same day in the afternoon in the waiting room of the village council Letnyanskoyi phone rang. Reported the death of Bogdan, who was killed by a sniper bullet killer. Varenitsa Roman M., 35. With Yavoriv Region. February 20 shot dead on the street. Big Zhitomir. 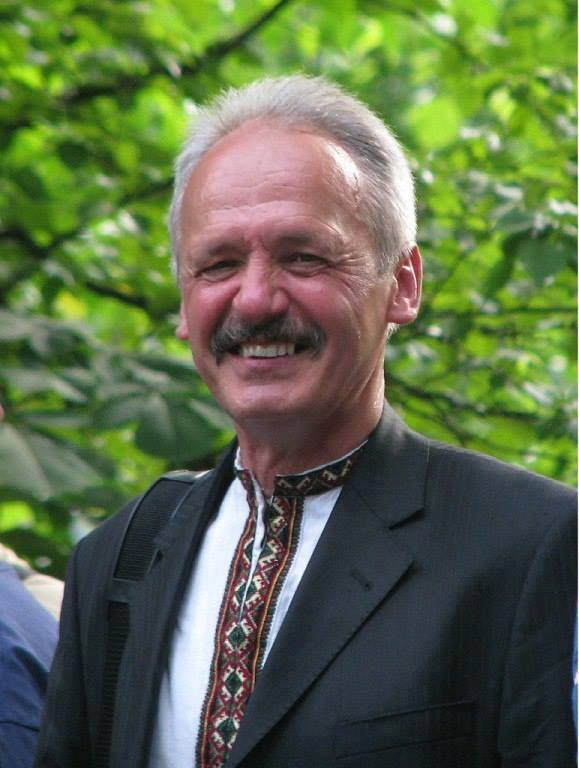 Vyacheslav Veremiy, a journalist of the newspaper "Vesti", 32 years. Titushky vystrelyly man in the chest. He died in the hospital the morning of February 19, 2014 due to loss of blood from the gunshot wound. Without father left 4-month son Vyacheslav. 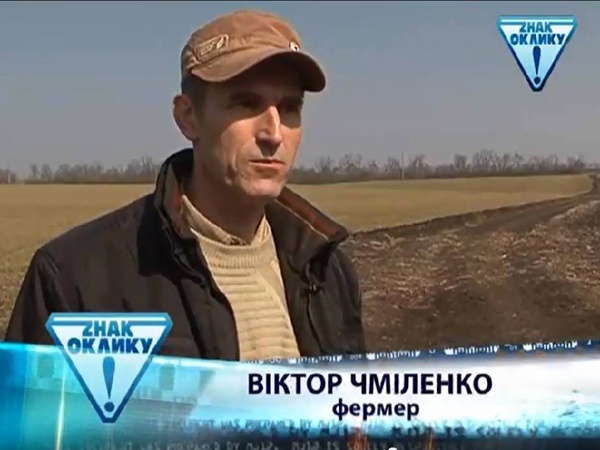 photo See #Vesti Journalist below. Hrynevych Edward Volyn, 30. He was killed on February 20. Dvoryanets Antonina, 62-year-old resident of Brovarov. February 18 her body is found on the barricades located outside Institute, at the upper entrance to the subway "Khreschatyk". Dmitrov Games (Igor) of s.Kopanky Kalush district, Ivano-Frankivsk region. Died February 20, 2014. He was only 30 years old. Within a few hours his hopelessly searched. 17:00 And about the 17 th hospital in Kyiv received information that Igor Dmitrov died. 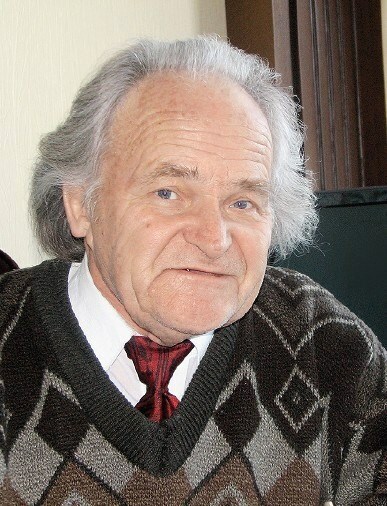 Anatoly Zhalovaha of m.Dublyany Lvivskoi region. , 33 years. Shot dead on 20 February. 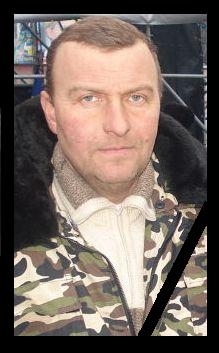 Vladimir Zakharov , 57 years. IT specialist. He died in a fire at the office of the Party of Regions to Lipsky . According to some sources , the man choked with smoke bombs after he was beaten with bats , pieces of pipe and feet. According to others, shot pistol shot to the head. Igor Kostenko , 22 , a student geographer from Lviv. Died February 20, 2014 . Cremano John of Kremenchug. Died February 20 Instytutska . Kotsyuba Vitali from Lviv, 31. 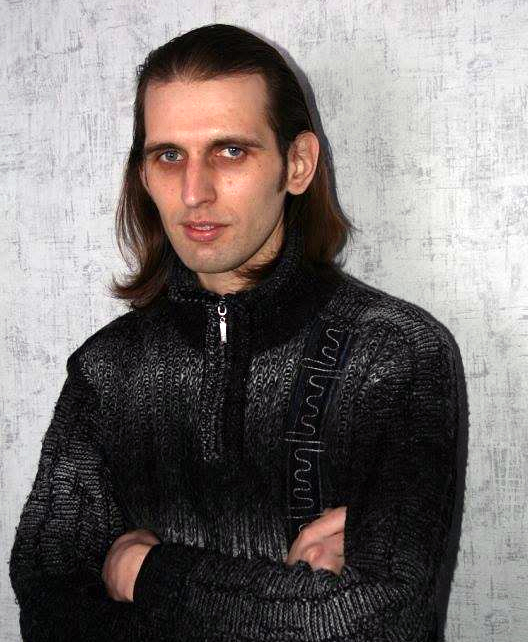 Born in the village Voroblyachyn Yavoriv Region . Died February 20, 2014 from a gunshot wound . He left a young wife and two kids. Dmitry Maksimov. Died February 18, 2014 . Silver and bronze medalist in judo Deaflympics in Sofia. Yomuvidirvalo hand grenade . Boy died from blood loss at the House of Unions. Opanasyuk Valery, Rivne. Born in 1971 . Rivne. He died on February 20 sniper bullets, leaving his wife a widow and four children - orphans. The youngest child - son - two years naystrashniy daughter - 12. Pahor Dmitry Khmelnitsky, 21. 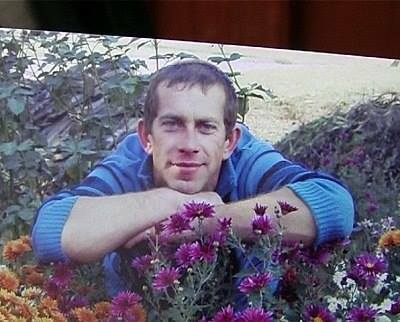 He died from a bullet to the head of the SBU in the walls of Khmelnytsky about eight pm, February 19, 2014 . 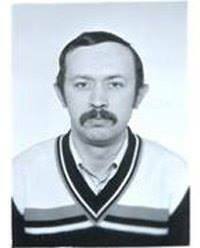 Parashchuk Yuri Talne , Cherkasy region , 1966 born In some lists the victims listed that he was a resident Talne , Cherkasy region. In others - that Kharkov. 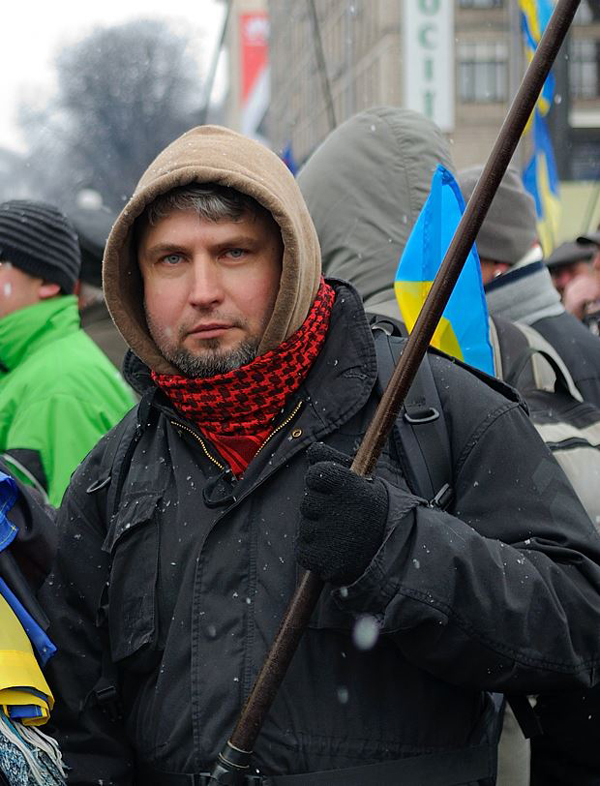 Member of "Svoboda ". Got a gunshot wound in his head of security forces during the retreat from the barricades in the street Instytutskiy February 20, 2014 . 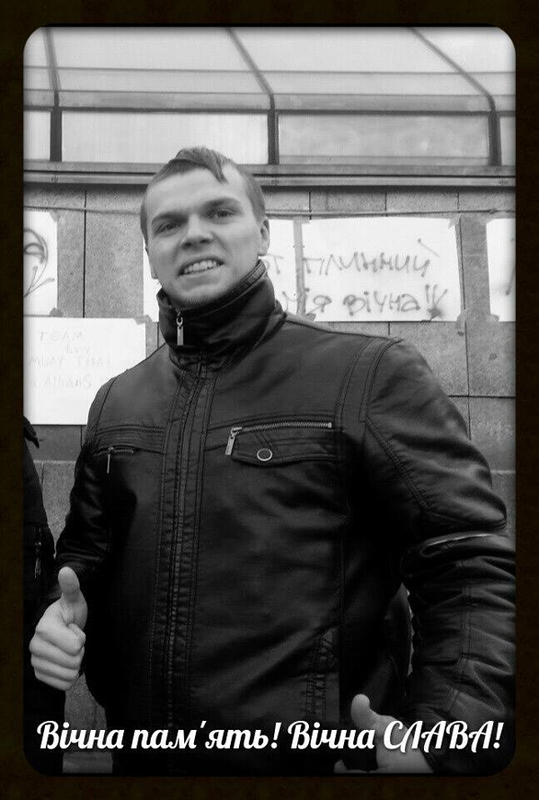 Pashalin Yuri from Cherkasy region , 1984 born Died February 20, 2014 in Kiev from 3 gunshot wounds in the back and pneumatic injury. Alexander Plekhanov , 22 years . He died on February 18. Leonid Polyansky , 38 years. He died on the Maidan. Relatives say he was a cheerful man and could not stand by lawlessness that takes place in Ukraine - and therefore went to Independence . He is survived by children from two marriages. 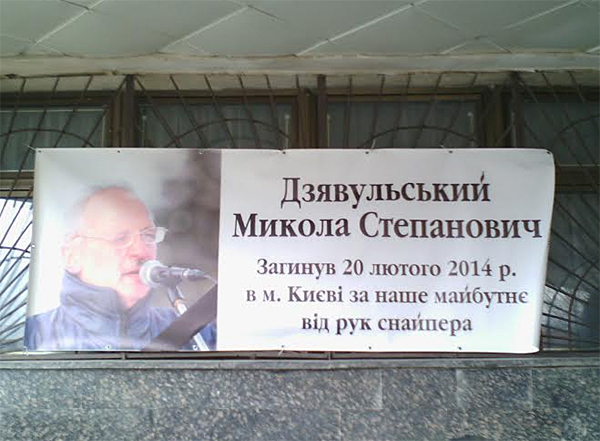 In recent years he lived and worked in Kiev, but the funeral will take place in Zhmerynka where I came from . Prohorskyy Basil, 33 years. February 18 was on the square , and since then been released on bond, was missing from the list . From FB : " 02/18/14 after work in time 17 . Poehal to Independence . During the 19th time. Already on Communications not vыhodyl . Nochevat not pryshel . Utrom not at work vыshel . Friend naydenы neighborhood of Cathedral Myhaylovskoho ego jacket and phone. Went to today opoznanye - vыbytы zubы , all blue ..." Recognize the body of February 22, 2014 . Smolynskyy Vitaly Umansky district,. Furmanivka . He died on 20 February. 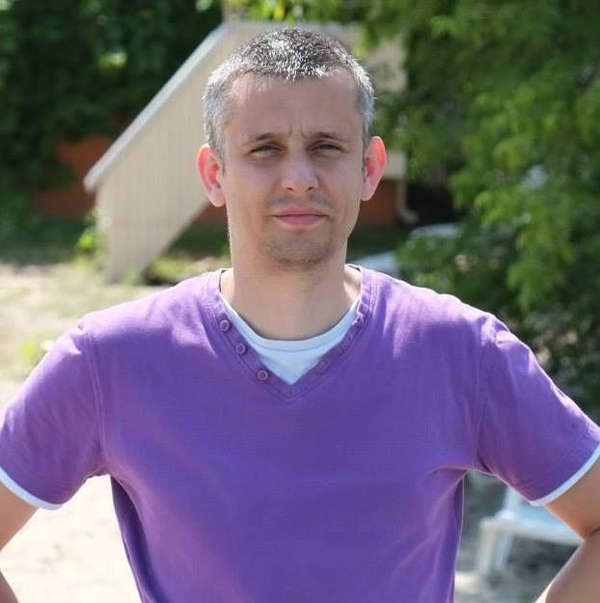 Solchanyk Bogdan , 29, from Lviv, historian, teacher of Ukrainian Catholic University. He worked at the Department of Modern History Ukraine UCF. Corroborated by a report from his funeral in Lviv. Tarasyuk John, Volyn region , town Olyka . Date of Birth - 28 January 1993. February 20, 2014 died on the Square from a gunshot wound . 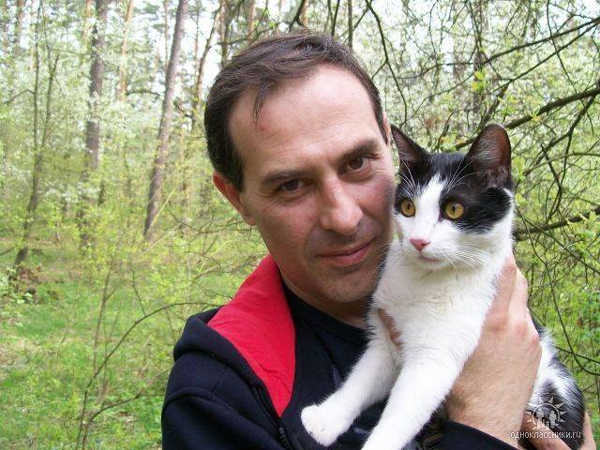 Tochyn Roman , 44, m.Hodoriv Lviv region. He died on Independence February 20, 2014 . Stayed (survived by) wife and two daughters. John Blok (or Tour - is the name of his wife, but since it is also called) , 40. He lived in town , Lviv Oblast. Private . February 20, 2014 at Instytutska he was killed by a sniper bullet . Without a father and daughter were little son. 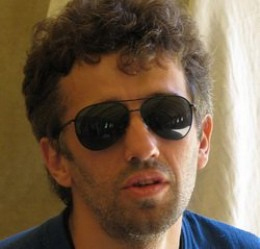 Ushnevych Oleg Drogobich born in 1982 He died on 20 February. Spayperom shot on Instytutska at the October Palace . Born in Drogobych family workers NPK OAO "Galicia" Michael and Eugenia Ushnevych . Many oil workers activist was remembered at the funeral of his mother in 1985 : Eugene Ushnevych died in childbirth , birth Oleg brother. Then three years Oleg, realizing what had happened , pale and defenseless tulyvsya to his grandmother . 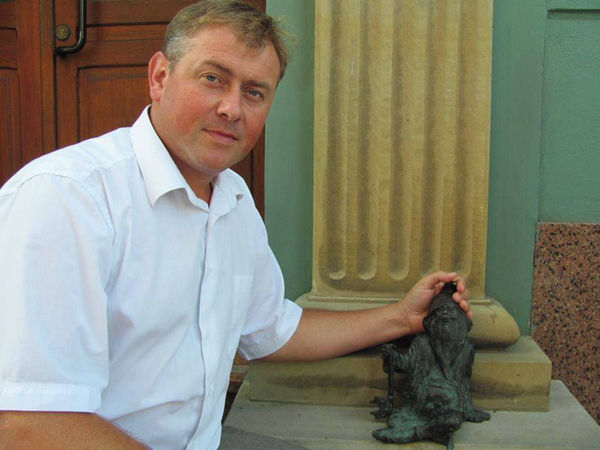 On the Square in Kiev, Oleg Ushnevych was from day one. It is well known in Skole District , where after university teacher . In recent years, leaving to work abroad. Hurtsiya Zurab from Georgia 54 years old. Body found at barricade located outside Institute, at the upper entrance to the subway "Khreschatyk ". Lived in Kirovograd. He died of a heart attack. Chaplinsky Vladimir Obukhov . His wife works in a kindergarten in the family - 2 children. Son and had a daughter. Kinglet Alexander from the village. Kalinin, Kyiv region . He died at the October Palace . Schvets Victor, born October 8, 1957 , p. Gatnoe Sviatoshynskyi Kyiv Kyiv region. 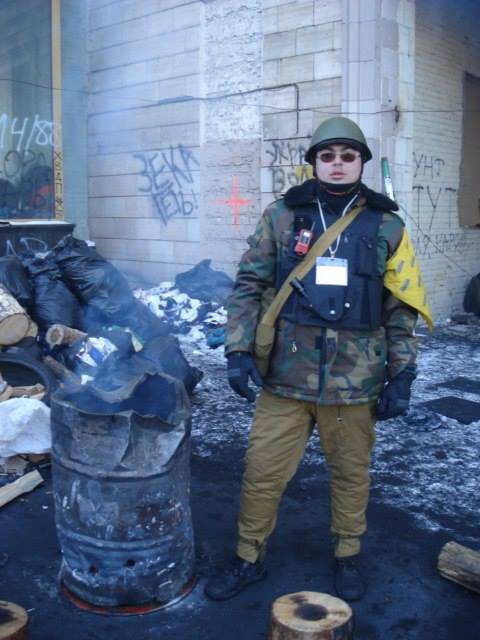 Around one in the morning of 18 February 19, received three gunshot wounds to the abdomen on the Maidan. Express took Viktor to the hospital, but he died on the way . No parent left the child . 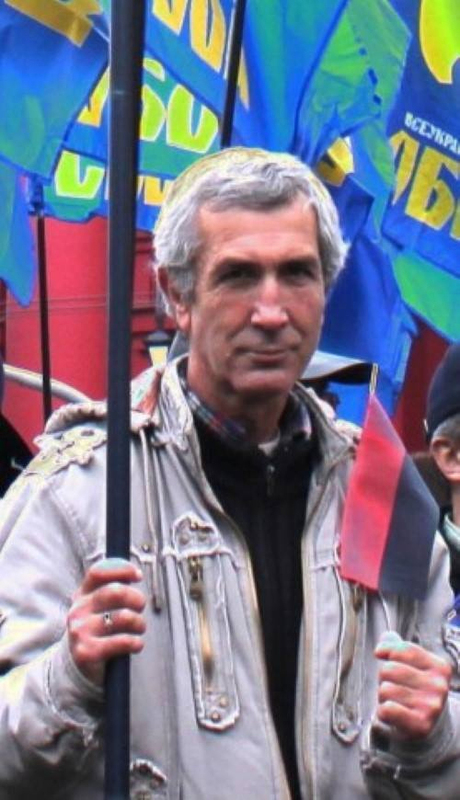 - Joseph Schilling , 61, of Drohobycha (Lviv region ). Together with his wife Anne gave birth to and raised two daughters who gave my grandfather and grandmother of four granddaughters . By profession - builder. Recent years have often traveled to Italy for work . His wife Anna works in Italy. On Kyiv traveled several times linger there for long. I live in a free, prosperous country - to grandchildren are not looking for happiness abroad. He died on February 20 headshots at the October Palace . - Shimko Maxim. 33 years , Vinnytsia. Died February 20, 2014 . The last record that people leave on their stoirntsi in "VKontakte" February 18 - " For Ukraine ! ! ! ! ! ! Anyone who can go to Kyiv !" This page was last edited on 5 June 2018, at 03:40.